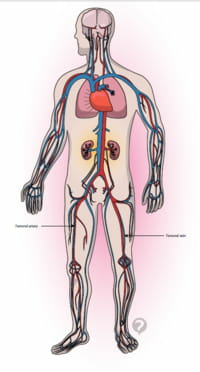 The femoral arteries, of which there are two in the body, are large blood vessels that bring blood and oxygen to lower limbs and to the pelvis. They begin at the external iliac artery, pass under the groin ligament, and descend to the knee, to the adductor magnus muscle. The femoral artery is an extension of the aorta and transforms into the popliteal artery below the knee. It is the preferred artery in which to place a catheter during a coronary catheterization. Original article published by Jean-François Pillou. Translated by Jean-François Pillou. Latest update on August 19, 2014 at 12:26 PM by christelle.b. This document, titled "Femoral artery - Definition," is available under the Creative Commons license. Any copy, reuse, or modification of the content should be sufficiently credited to CCM Health (health.ccm.net).